Hi Friends! I didn't get to do a Christmas post last month because like everyone else, I was superbusy sewing, making, baking, and I dare say, buying gifts. One of the gifts I was asked to make was a surprise diaper bag, purchased by her sweet husband (all behind her back, she didn't have a clue)! Alot of labor and love went into this bag and when it came time to pack and ship it out, I so wanted to keep it for myself. I spent hours and days working on it and I chose some of my most favorite fabrics, so it was really hard to part with it. But, it went to a really good friend, and I knew she would love it (or I hoped she did) as much as I did. I used oilcloth for the main zipper and bottom of the bag. The bag has a total of 3 compartments. The first compartment has a large zipper pocket for keys, cell phone, and such. The middle (or the main) compartment is lined with waterproof fabric and has 3 pockets for bottles, diapers, etc. The back compartment has 2 pockets for toys, nappies, etc. The total size of the bag measured about, 16 x 6 x 12, so this was the largest bag I've ever made. I also added a removable adjustable strap. I usually only make diaper bags on special request/orders. I have to admit, this was the hardest bag I've ever made, but so worth it in the end! 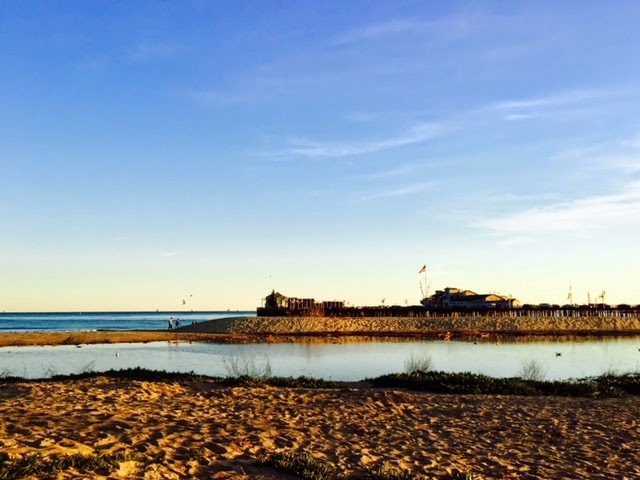 For Christmas, my husband planned a mini Christmas trip to Santa Barbara as a present. It was a much needed vacation of relaxation, wine tasting, and like all of our trips - too much food. We went to a beautiful French Bistro that my sis actually had her wedding reception here a few years back, so it was a nice treat to eat there again. One of the best parts of the trip was when we bought some french fries and brought it down to the beach while looking at this view. Pretty right? On the way home, we stopped by Ventura and Superbuzzy, a Kawaii fabric store! I was greeted by a giant bee on the side of the building. How cute right?! They have an awesome website filled with fabric, gifts, supplies, and more, so be sure to check it out! I was so happy to actually go into the brick and mortar store I probably spent about 1 1/2 hours just browsing the rows and rows of fabric and supplies! Here's my fabric haul from Superbuzzy. They were having a great sale (which I think is still going on?) so I stayed under my $100 budget (Christmas gift money yay!). Not sure what do with these quite yet. I'm totally in love with the wavy stripes and dots print. Thinking of making a cute shirt, but most certainly some bags! Stay tuned! And don't forget about my Hello Kitty Con giveaway! 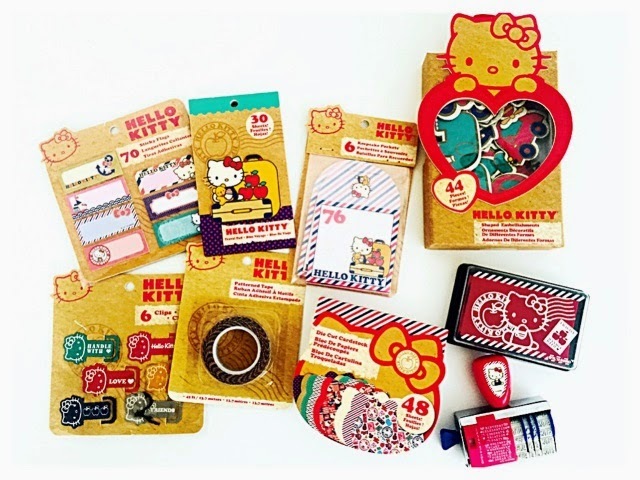 I'm giving away a haul of Hello Kitty Con Scrapbooking exclusives. Click here to read all about it and how to enter! The giveaway ends 1/11/15! Hello Kitty Con 2014 and a Giveaway! 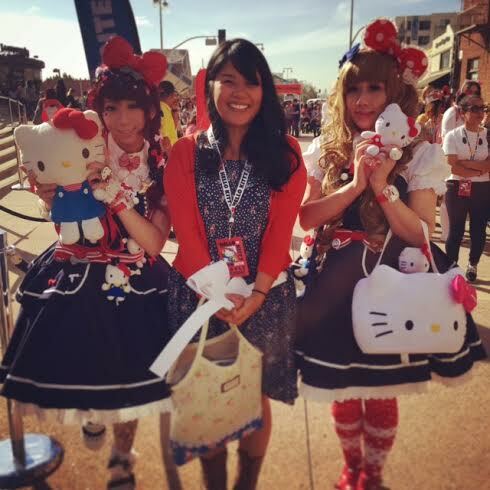 I'm a huge Sanrio/Hello Kitty fan (yes, I'm a full grown adult but I still love it) and I was blessed to attend the first ever Hello Kitty Con in Los Angeles, last October, 2014. Even if I had multiple shows days after, I didn't care, I had to go. So I did, and I dragged my sister with me! It was everything I ever hoped it could be and more! I went on the first opening day on Thursday, so it was CRAZY crowded. Smiles everywhere, there wasn't a rude person in sight, everyone looked happy to be there, including myself. Most of the people who attended weren't kids, but full grown kids like me! There were cute cosplay girls everywhere! Some worked for Sanrio, but I think most people came dressed up. I on the other hand will not go that far, but I did wear Hello Kitty-esque colors. Sunshine and rainbows at the entrance. Hello Kitty topiary! I need this in my front yard! Cute DJ spinning cute music! One of my favorite parts of the convention was the Hello Kitty Vintage Village. It had a bunch of vintage HK stuff from the beginning, even the first Hello Kitty coin purse ever made! They even put it in a glass case (a la Hope Diamond), complete with it's own security guard. Makes me wish I saved every Sanrio thing I ever bought when I was a kid. Most of the the stuff encased in glass I had! Darn. Loved the wall of every gift bag ever made. Now this brings me to the Super Supermarket. I wasn't able to get into the souvenier market. The line was 3-4 hours long just for Hello Kitty things with Con 2014 on it. I was still able to purchase cute things and my favorite purchase - Hello Kitty Spam Musubi Maker! I'm going to keep it in this nice box forever and never use it, but I think the Spam lasts forever right? Again, the long lines were FOREVER, and I missed the opportunity to meet the head designer - Yuko Yamaguchi, but I was lucky enough to at least take a picture of the autograph and drawing she does for each fan from my neighbor at the Scrapbook Workshop. Yes, her name was Janae, not Karen sadly. Next was the Hello Kitty Scrapbook Workshop, hosted and taught by Amy Tangerine, a scrapbook star in her own right. This was the best part of the convention! So, this brings me to my big giveaway! I ended up getting double of a couple of things at the convention, and I know I can't hoard it all (New Year equals getting rid of things per my husband). Why not share it with my friends! Here's what's at stake - Hello Kitty Scrapbooking, exclusive to Hello Kitty Con 2014. To enter, you must enter a comment of your favorite Sanrio character and follow me on Instagram - creamcraftgoods. To leave a comment, enter your're comment below (must be signed in google or select open ID and add your name to leave comment). Entries must be made by January 11, 2015 (PST). Giveaway only for US (sorry, this would be too expensive for me to ship overseas). Prize value - This was a Hello Kitty Con exclusive, so this is a collectible. I think it's around $40 retail, but you can't put a price on a Hello Kitty collectible! I will tally up the entries and do a random drawing on January 11,2015 with the winner announced on my blog on January 12, 2015.